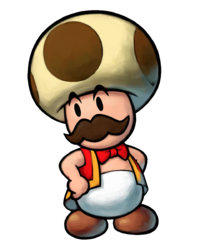 Toadsworth the Younger is Toadsworth in his middle-aged years who appears in Mario & Luigi: Partners in Time. Ever since he was young, he has been worrying about Princess Peach, though much less than the future Toadsworth. He and the present Toadsworth team up and teach the Mario Bros. new moves while trying to entertain Baby Peach. Toadsworth the Younger looks fairly similar to the present Toadsworth in overall appearance, but there are some differences. He wears a red jacket rather than purple, and has a brown mustache rather than white. However, he has the same brown colored spots on his hat, which Toads are supposed to get when they reach old age. Also, unlike his future counterpart, he does not wear glasses. He also does not occupy a cane. He also still has his bow tie. When Baby Peach is sent flying through the hole after the Baby Cakes move is learned, Toadsworth the Younger says that she isn't in another castle, a reference to the line used by various Toads in Super Mario Bros. This page was last edited on April 5, 2019, at 13:09.